Here I am back in Seattle after a holiday to Spain and Italy. Man, that flight is lonnng! It’s an even longer travel day with layovers. And so, a super comfy outfit is in order. 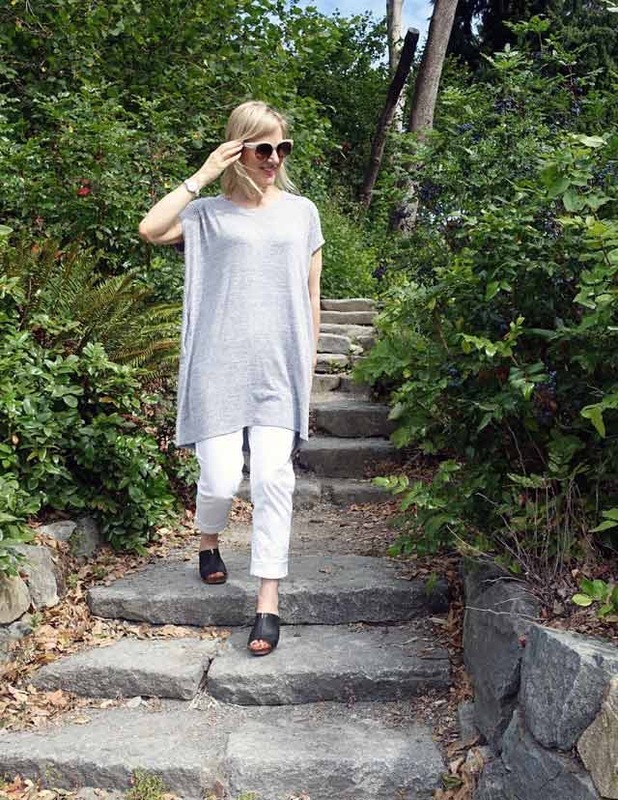 This is my latest summer travel outfit for extra long flights! The tee also has an ultra relaxed fit. In fact, I have used it as a nightshirt when I’ve forgotten pajamas for a trip. Since it’s so loose, it pairs nicely with these rolled-up, narrow-legged jeans. Showing a little ankle does wonders for keeping the frumpy factor at bay – not to mention shoes with a heel! And speaking of heels, I found these mules in Italy. They’re a perfect shape for easy walking and even easier to slip out of in order to put on my fuzzy socks during the flight! The shopper bag is also a recent addition, purchased in Italy. Similar to the YSL bag I carried onboard during this last trip (seen HERE), it gives the outfit a boost of color. It even has an adorable metallic pink tote that zips. With this, valuables can’t possibly fall out when I place it on its side in an airplane. And best of all, it’s lightweight and large enough to hold my laptop. It was also ideal for my shopping day in Milan! 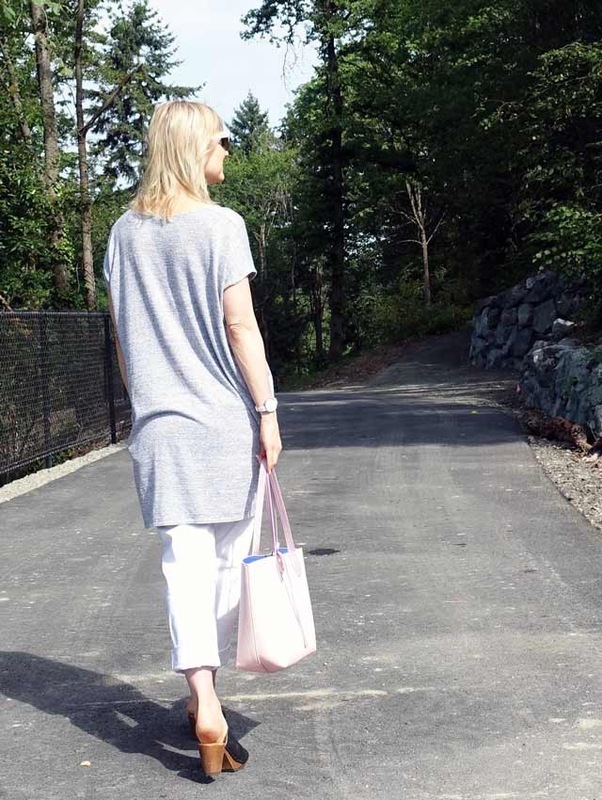 I love this casual, comfy summer travel outfit for long flights. It’s not bad for short flights either. In fact, I’m thinking that I might wear it next week on my flight from northern to southern California! Now that I’ve returned from my big trip, by the way, we’re back to posting three times a week. And we have fun looks in store. I, for one, cannot wait to show you brightly-colored acquisitions from Spain and Italy. And I’ll be sharing newly gathered tips about packing for a summer vacation to fabulous shopping destinations. Stay tuned! A great look for flying! Looks so comfy and stylish too. Have a great day! I love this outfit because it’s super comfy, yet stylish and cute! You look fantastic and this outfit looks super comfortable. The top is lovely! Love the design. I love how comfortable this outfit looks! Love the mules too! So important to have comfy travel outfits! This one is so adorable and perfect for travel! What a cute look! Your photos are stunning! Thanks for the inspiration!